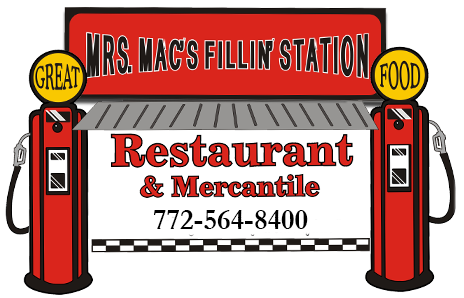 Mrs. Mac's Fillin' Station | Restaurant and Mercantile in Vero Beach, FL! Wow "E" We slow cook choice rib each week for tenderness. BAR-B-Q basted grilled chicken topped with smoked ham, crispy bacon, & Fresh O-rings, then smothered in melted cheddar jack cheese, served over a bed of shredded lettuce and diced tomatoes, Served with jalapeno ranch on the side. Tender 6 oz Sirloin strip lightly seasoned Plus 6 chef dusted butterflied shrimp, deep fried to golden brown. Broiled fish topped with diced red ripe tomatoes, green onions & melted swiss cheese. 8 Lightly dusted butterflied shrimp deep fried to a golden brown. Fresh hand cut tender 6oz sirloin cooled to order topped with our garlic red pepper butter. Large portion of fried clams strips served with cottage fries and slaw. YEP, it's all "U" can eat fried FISH or shrimp or both, with 2 side car items.